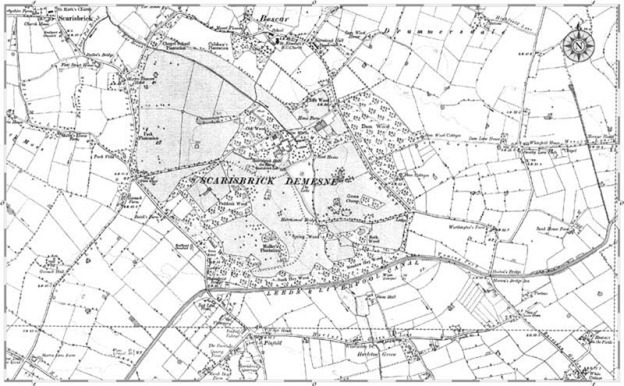 Scarisbrick Parish, the largest in Lancashire was in early times much avoided by travellers. With its vast tracts of poorly drained peat marsh and the huge lake of Martin Mere forming its northern boundary it was difficult terrain to cross. The original small scattered farmsteads of the parish now form the basis of today’s hamlets of Barrison Green, Bescar, Carr Cross, Drummersdale, Hurlston, Pinfold and Snape. Farming was hampered by poor drainage but these conditions led themselves to the growing of flax, hemp and willow – used by local craftsmen to produce rope, baskets and linen. There was ample fishing in the mere and the drainage ditches for freshwater fish and eels. This was an important supplement to the farm produce which could be taken to the nearby Ormskirk Market.